*HB507 / SB1417 – these bills would reduce possession of an oz or less of cannabis to a civil penalty, similar to a traffic ticket. *HB 3785 / SB1339 – these bills would create a comprehensive medical cannabis program in Texas. *HB2165 – this bill would fully repeal marijuana prohibition, removing all statues from Texas law. We will meet at City Hall at 11:30 am and march down Congress at HIGH NOON and up to the Capitol’s South Steps where we will hold a rally until 4pm. Patients will lead the March with a banner. Veterans are encouraged to wear hats, shirts or ribbons identifying their military service and dedication. Bring an umbrella for shade while you march. We will provide water at the Capitol Building Steps. Stay tuned for updates here. We will have some signs but please feel free to make your own and bring it. … and more to be announced! Music by the lovely songstress, Eve Thompson! City Hall – City Hall has a parking garage at 301 W 2nd Street under City Hall Building. It is first come first serve parking, free till 5pm and $8 flat rate afterwards. There is handicapped parking in the garage. There is also a parking garage at 100 Congress Ave P1 or State Garage N on W 3rd St. There will also be several other parking lots in the area and surface street parking. Capitol Building – Please park in the Visitor Parking Lot at 1200 San Jacinto. It is free for the first 2 hours and then charged hourly but no more that $8 for the whole day. There is handicapped parking in the garage as well as on the surface streets to the East of the Capitol Building. Please remember that metered parking around the Capitol Building only accepts change not credit cards. It is important that all Texans from all cities come and show their support for drug law reform and help us keep the eye of the media and our lawmakers on this critically important issue! Therefore, Texas NORML is sending a delegation to the marches in the following. These cities will also be arranging caravans to Austin so we can show a united front at the Capitol during the Legislative Session. *DFW NORML March – Saturday, May 2nd – If you live in the area or are able to attend, please stay tuned here for updates. 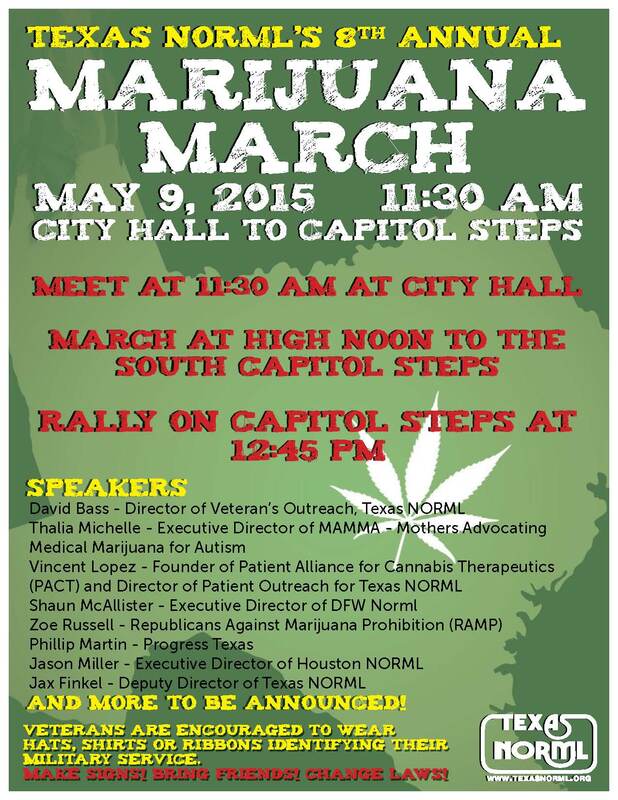 *Houston NORML March – Saturday, May 2nd – If you live in the area or are able to attend, please stay tuned here for update. *San Antonio NORML – Sunday, May 3rd – If you live in the area or are able to attend, please stay tuned here for updates. Remember, the problem is the LAW, not the plant! It starts with the marchers arriving at the capitol and includes excerpts from all of the speakers except Phillip Martin. The audio isn’t great, because I recorded some of this away from the PA speakers and because there was a lot of wind noise, so I had to transcribe the audio. Still, it gives some of the highlights of the event. Thanks for the work you folks have done on Texas’ marjiuana legislation. I haven’t been active in this fight lately, but I renewed my Texas NORML membership after the march, and I’ll try to get more involved. Decriminalization Bill Filed - Support SB 460! Medical Cannabis Bill Filed - Support HB 1365!